iClass, arguably the second most widely deployed technology in proximity card access systems (the first being the ProxCard II), is a proprietary RFID communications standard and card type. It provides an enhanced level of security over the ProxCard as it encrypts the data stored on the card and leverages a challenge/response form of authentication between the card and the reader. At the 27th Chaos Communication Congress (27C3) Henryk Plötz and Milosch Meriac took a look at iClass systems. They ingeniously dissected the RW400 iClass reader and released a method to dumping it's firmware via the exposed In Circuit Serial Programming (ICSP) interface of reader's PIC18F452 microcontroller. Within the firmware were the keys used as part of the iClass card to reader authentication making it possible for anyone with the appropriate skill to read and clone these cards. It was an awesome moment for RFID and hardware hacking geeks everywhere! But... there was a slight downside - the method of dumping the firmware was a arguably brutish. You have to actually overwrite a portion of the reader's firmware with "dumper code" that reads and then dumps the remaining portions of it's own firmware. To obtain a complete firmware image, you have to have access to two readers. This isn't that big of a deal when targeting "Standard Security" iClass implementations because you can just buy two RW400s, get their keys, and be forever happy since the keys are static across all cards/readers. But when it comes to "High Security" implementations, you have to physically remove a reader from the wall within your target's facilities, dump a portion of the firmware, then using another reader, dump the portion of the firmware you overwrote with the dumper code on the first reader. I should say that in theory you could just write the dumper code, dump the area of the firmware that contains the keys, and then just leave the reader in a inoperable state - but a good hacker wouldn't be a jerk and just leave a broken reader laying around so lets just forget about that option. Those interested in RFID hacking have probably stumbled upon http://www.proxclone.com/ at least once. It's a humble site in which the author takes on various RFID related hacking projects. 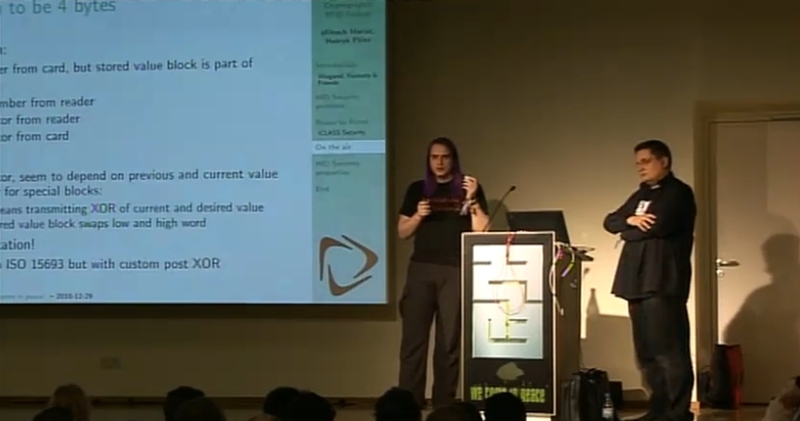 One of the projects was to emulate the iClass work presented at 27C3. The author successfully re-enacted the method on a RW300 reader using the same general idea, but with the author's own code and different tools. Well done. Even more interesting though was that during the re-enactment, the author discovered a new method to gain access to the reader's keys - one that only required access to a single reader, didn't involve overwriting the firmware, and even yielded the last read card value stored by the reader! Henryk Plötz and Milosch Meriac leveraged the FTDI TTL-232R-5V-WE to interact with the reader's microcontroller. It's a simple and elegant solution and I really wanted to use it to implement the proxclone method. The TTL-232R-5V-WE's true power is shown through its "bit bang" mode that allows its pins to be individually controlled. This makes it possible to emulate the PIC programming hardware without the restrictions imposed by more traditional PIC programmers. It costs around $20USD. The only additional hardware requirement is a power source to bring the PIC into High Voltage programming mode. I used a 9V battery power supply enclosure that included a switch so I can enable/disable it as needed. So all in all, we're looking at about a $25USD investment! I choose this method because its easy and I'm working on non-persistent BT5R3, alternate installation methods are detailed in the ReadMe.txt included within the archive. Once the hardware is all set up, connect the FTDI adapter to your Linux box. You may have to rmmod the ftdi_sio and usbserial modules so that the D2XX drivers can work. iclass_eeprom_dump-d2xx will give you 20 seconds to connect the FTDI cable and apply the VPP programming voltage. The program will continue and start dumping. About 10 seconds later, you'll have the full memory dump. Note that I'm not disclosing the offsets for any keys, so you'll have to figure them out yourself. iclass_eeprom_dump-d2xx automatically provides the key permutations so you don't have to worry about running them through permute.php. Why would you have to have a second reader on site to hack a target device? Provided you had your own reader (1), dumped the portion of code that will be overwritten on the target (2), and kept it stored as a file on the machine you intend to use to hack the target, you would use the first device only to get the block that you overwrite with dump code, then flash dump code to (2), read keys, and re-flash (2) with original code dumped from (1) before making off with the keys. The old method required two readers: one to dump the main firmware, and another to dump the boot area. Each time you destroy some of the code so you need two readers to reconstruct the entire FW image. This method requires about 60 seconds to dump everything. Hey, where did you buy the 6 input reader pin and the power adapter? cant get it to work, tried different cables on a Rev A reader, all i get are zeros. When I do eventually get data, its its stack variables that have somehow corrupted the array of so-called registers.